Sometimes the twist and turns of fate can make you sit back and ponder those magical things we call coincidence. Early yesterday morning, via the internet, I learned that one of our finest fantasy, science fiction writers had died; Philip Jose Farmer. Amongst his many popular works, Farmer had invented a strange heroes mythology wherein he surmised not only were all the great literary heroes of the late nineteenth and twentieth century based on real people but that they were also related in one fashion or another. This was called his Wold Newton Mythology. In this fanciful theory, Farmer postulated that there had actually been a 1930s globe trotting adventurer who was the basis for the pulp hero, Doc Savage. Farmer also suggested this man was related to the jungle lord we call Tarzan. Amongst his elaborate genealogy of heroes, Farmer several times replaced the name Savage with Wilde, again to indicate historical personages and their fictional disguises. So why bring this all up now? 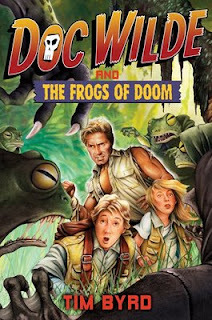 Simply because on the day I learned of Farmer’s passing, this book arrived on my doorstep; DOC WILDE AND THE FROGS OF DOOM by Tim Byrd. In his action-packed story, Byrd tells us this Doc Savage figure not only existed, but that he went on to marry and have a son and grandchildren. The son is one Doctor Spartacus Wilde, a golden hued chip off the old block. Like his dad, now ninety-nine but still fit as an Olympian athlete, he is a famous scientist, inventor and world traveler. He is also a widower raising two fantastic kids, Brian and Wren, both of whom have inherited the family adventuring genes. The trail of the missing senior Doc leads our group to the South American jungles of Hidalgo, as yet another well known name from the Savage canon. The innocent fun of this book, which is a Young Reader’s offering, is that it does not attempt to shy away from its origins and is a worthy pastiche for all Doc Savage enthusiasts. Byrd is having a grand time offering us a satisfying what-if adventure that rings true from start to finish and left me wanting more. All the trappings and clichés of the hero pulps are here, but presented in such a fresh and carefree manner, the reader will be swept away by the outlandish exploits performed by this one-of-a-kind family. The Wildes are old fashion heroes in the best sense of the word and their adventure is sure to thrill pulp fans, both old and new. Don't miss it!